Founded to facilitate the career goals of nursing professional, Mantram Nursing Academy has a long way resonance. While providing exclusive OET coaching , we boost your profession-specific English language skills which are tested in OET. Here we work for stimulating the real workplace like scenario and provide relevant guidance to the nursing professionals while providing coaching for OET exam in Chandigarh. If you are a healthcare professional and dreaming to register and practice in English speaking environment then OET ie Occupational English Test is a must-go route for you. After passing OET Exam, you will be certified to practice in countries like- UK, Australia, New Zealand, Dubai etc. Mantram Nursing Academy is best institute to visualize your dreams. Your hunt for the best coaching centre for OET exam in Chandigarh, end up here as we have kept a dedicated series of classes for OET exam for nursing students. Our result of the OET exam makes us a strong contender among the OET aspirants in Chandigarh area. At our institute, our experienced facility members put in committed and comprehensive efforts to train, educate and help practicing students for the OET English Language Test to inculcate in them profession-specific skills – Listening, Reading, Writing and speaking of English language. 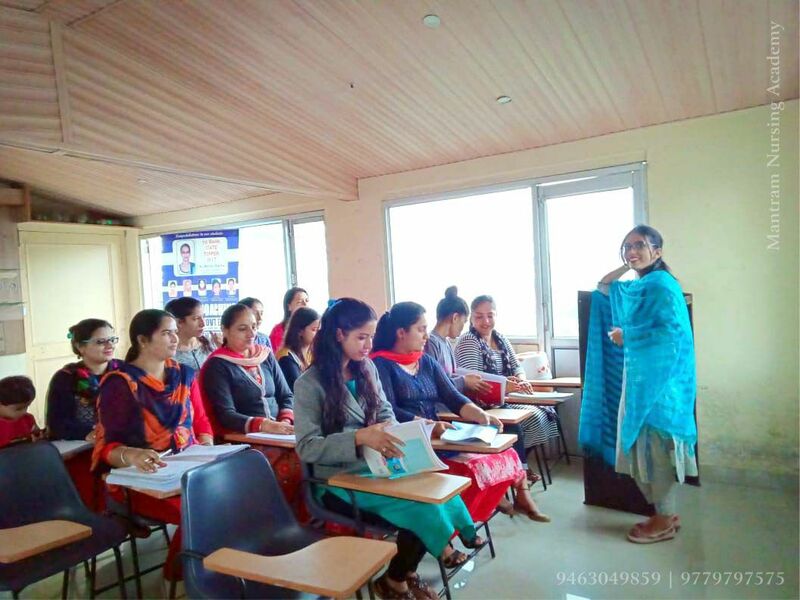 Directional Guidance and Augmentative approach of learning- Mantram Nursing Academy was founded dedicatedly not only to address competitive exam related needs of healthcare professionals but also to boost them till their dream job. Our systematic efforts and augmented learning approach help our students to set benchmarks in OET Exam. Perfect study Environment for OET Exam- Apart from providing the directional classroom teaching, we understand the essence of the right study environment. Therefore, we scale up to ensure perfect study environment for OET to each of the Mantram Student by enabling class room discussions, tutorials and also to avoid overcrowding of classroom, our highest take-in is 25-30 students per batch. This helps us to attain qualitative results with one to one marking. Result-oriented coaching- Our Highest results in number of qualifying students have made us the one of the top coaching centre for OET in Chandigarh region in terms of result. Mantram Academy in Chandigarh leaves no stone unturned to justify the hard efforts to make students clear this exam. Our result-oriented coaching ‘modus-operandi’ has, therefore, earned us a name. Structured modules/Plan Out for classes – We understand that a good tutor cannot steer into the classroom directly without a proper module/ structure or plan for the exam. Therefore, structured modules for occupational English Test are the premier part of our planning at Mantram. Also, with Innovative tactics, we have organized time-table as per the learning pace of students. Guidance from experienced faculty- Our excellent troop of well qualified and experienced faculty members ensure that the personalized attention and customized support is available to every student at each step of their preparation. Through expert guidance, delivery, and training we enable our students to clear OET exam. And, thus justify our self as one of the best institutes for OET Exam in Chandigarh. 6. Designed with specialized teaching methodology for OET Exam– Academicians at Mantram Institute believe in comprehensive teaching approach. Hence, they have designed special teaching methodology for OET exam and to cover every concept from basic to the advanced level through innovative pedagogy. Also, Mantram Study Group has deliberately kept room for practice, revision, handling queries, doubts etc. Inculcating Time-Management in OET Exam Aspirants- We create a real-time exam like scenario at through our mock tests by asking them to complete exam within a stipulated time frame. This enables our students to conquer fear and learn time-management with respect to OET exam in Chandigarh before they actually appear for it. Study Material, Notes, booklets of competitive subjects/exams- We, at Mantram Nursing Coaching institute, provide the complete and comprehensive study material for OET exam, to which the students can refer to again and again. Our class notes, concept-oriented notes, and booklets are extremely to the point to help students in passing this exam. Classes repetition option is available- As an added advantage to OET aspirants at Mantram Academy, they can repeat the classes any number of times with no extra charges till the time they clear the exam. Meanwhile, our team always keeps looking on the updates for OET exam to help aspirants appear confidentially in ever-changing patterns of this exam.